After today there are two more episodes left of Joseon Gunman and it’s been a really steady and satisfying ride. It makes me ponder whether I like the epic crash and burn excitement or this type of slow burn reliability in my dramas. Probably both and depending on my mood, but if I were rational then the latter is a better choice because I’m not going to be aggravated. I really do appreciate JG for everything it’s delivered so far but impossible to deny that it hasn’t lived up to its potential. The romance has been beautiful but not very passionate, and goodness I need passion in my lead couple! I suppose Yoon Kang staring with longing at Soo In until the cows come home works but that lacks the oomph which elevates the pining into something more concrete. I’m also getting the weird feeling like many deaths are in store, yet there is a lack of worry that would accompany it because both the leads and the villains have escaped the chopping block one too many times. It’s easy to criticize JG for being too rinse-and-repeat and which sageuk hasn’t done that since ultimately the same dangers abound merely wrapped in different clothing. That is true here but the crutch turned out to be keeping Merchant Choi as the one main villain through the entire narrative. He’s fantastic, don’t get me wrong, but now I think he should have died in episode 14 and then Hye Won is elevated to the big bad in her daddy’s stead. Keeping him around makes ever dangerous encounter feel like a retread, and it shoves her into being just a cackling minion and honestly she was much more than that. Episode 20 felt like even more filler to set up the big revolutionary coup, and I can’t even support the revolutionaries all that much because history tells me they fail and even if they succeeded there is this niggling sensation that nothing will ultimately change. Power corrupts, absolute power corrupts absolutely. Only Yoon Kang and Soo In remain my beacon of hope, an innocent and pure hope from the first few episodes when they dreamed of a future together that was exciting and filled with curiosity. Now they are left a shell of their former selves, hardened by loss and disappointment but still clinging to each other and the promise that together everything will be okay. I sure hope that happens in the end because this is a drama where I’ve stuck around this long with the promise of real romantic satisfaction. 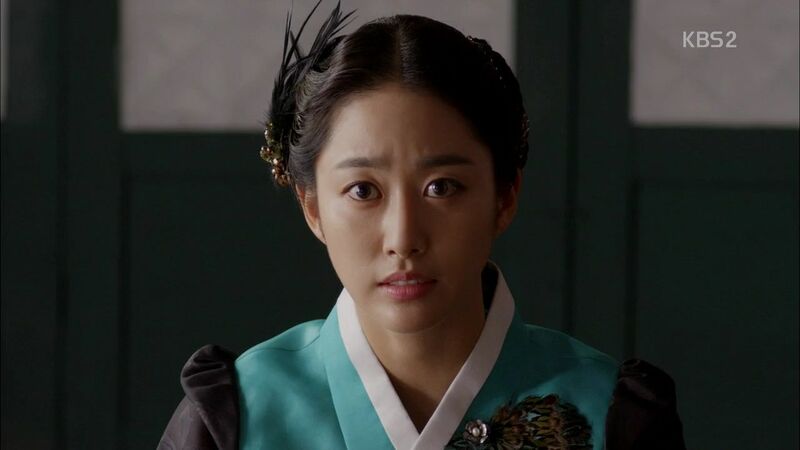 Soo In enters the palace as an official court lady, leaving both her and Yoon Kang crying at yet another separation. Yoon Kang confronts Scholar Kim as the reason behind Soo In’s decision to become a court lady and he doesn’t deny it. Yoon Kang doesn’t understand why it has to be Soo In, and why as a court lady? 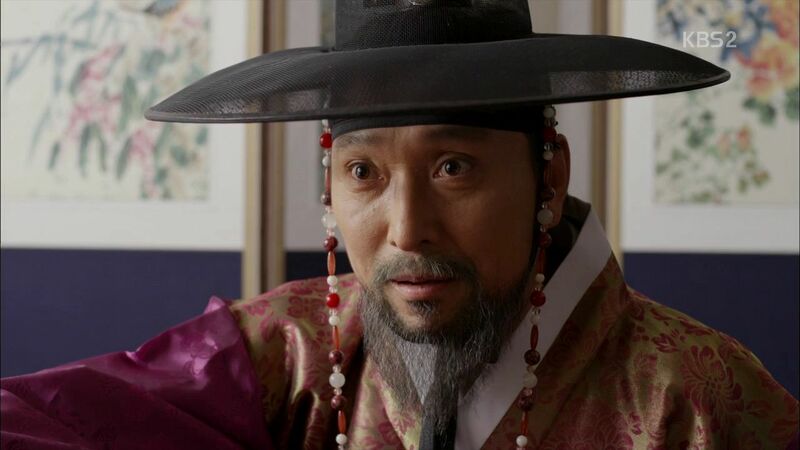 Scholar Kim explains that Queen Min trusts Soo In and they need someone who is their eyes and ears inside the Palace. Yoon Kang cries that Soo In is his everything, his reason for living. Why does he have to take her away from him? Scholar Kim’s feeble excuse that Soo In decided on her own to do this, and is doing this to protect Yoon Kang, none of that flies since she now belongs to the King. Scholar Kim explains that Soo In wants to change their world so that Yoon Kang is never hunted again, so that he no longer needs in live in a web of danger. Yoon Kang has no choice but to join with Scholar Kim and make sure his revolution succeeds since that is his only way to get Soo In back. Yoon Kang’s scream of rage is what we all feel right now. Soo In is dressed as an official court lady and her eyes betray her sadness as she remembers all her sweet memories with Yoon Kang when they dreamed of a bright future together. Yoon Kang goes back to his ransacked residence and encounters the litter slave orphan boy who has recovered from getting run over by a horse. The boy is hiding here from the authorities since he’s a runaway slave and he knows Yoon Kang saved him twice, once from the horse and once as the full moon gunman who released the slaves at the gold mine. 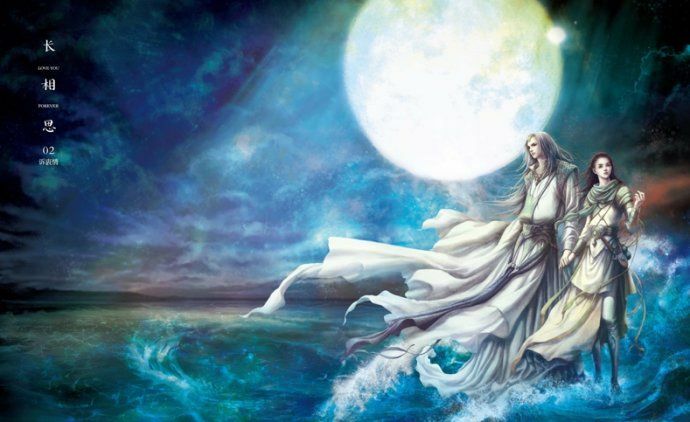 He wonders if Yoon Kang also has nowhere to go and encourages Yoon Kang that he still has a purpose in many suffering slaves out there who need rescuing. 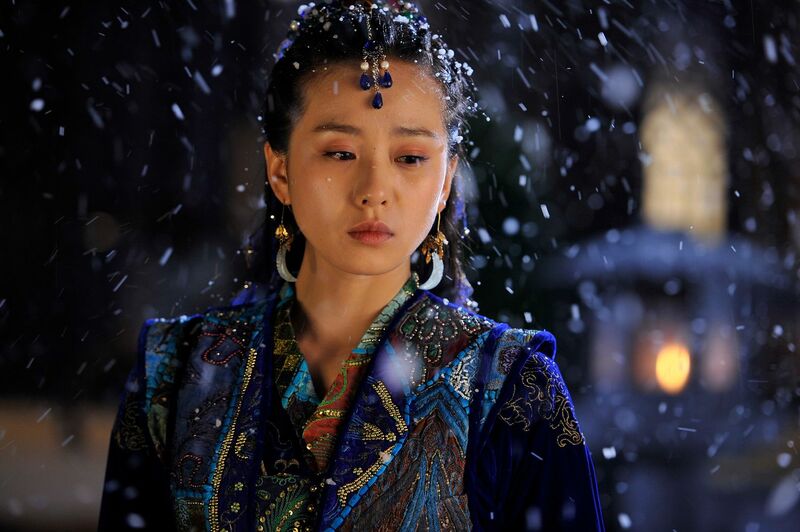 Soo In walks through the palace with the other court ladies and exchanges a sad glance as she walks past Ho Kyung. Officer Han walks through the palace with Officer Moon and talk turns the guards all using new guns now. Officer Han pooh poohs that as he wants to keep using a sword since it’s way cooler. Officer Han asks if the palace is safe now and Officer Moon warns him to be on guard because danger can arrive at any moment. Officer Han is shocked to see Soo In but she’s called away before they can talk. Merchant Choi and Hye Won hear that Park Yoon Kang has not been seen in the provinces where the Princess’s husband is stationed. Hey Won suggests not tracking down Yoon Kang now since he’s a wanted man and can only hide. Merchant Choi disputes that, he knows Yoon Kang will stop at nothing to try and kill him so their fate is for one of them to die. Hye Won offers to keep looking for Yoon Kang so her dad can focus on his official government duties. Yoon Kang walks with the little boy and hears that his dream is to become a scholar and learn how to read at a school. He knows this dream is impossible and all he can pray for is to not go hungry. 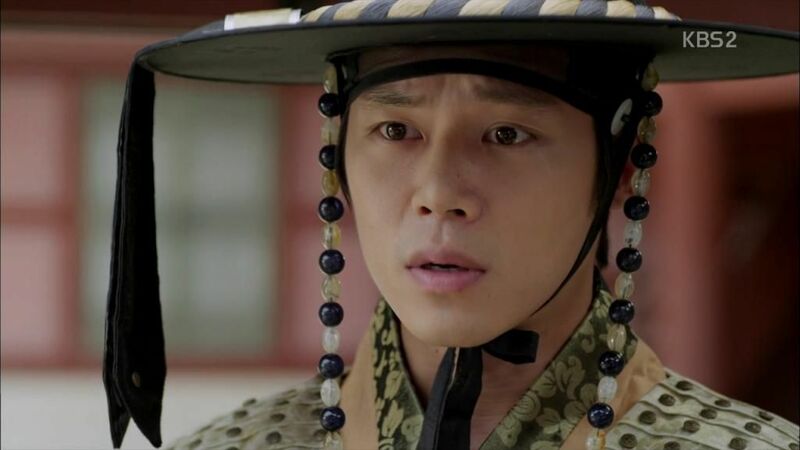 Yoon Kang takes the boy back to Scholar Kim and the Princess’s husband and announces that he is joining in their revolution. If for Soo In’s sake he needs them to succeed. 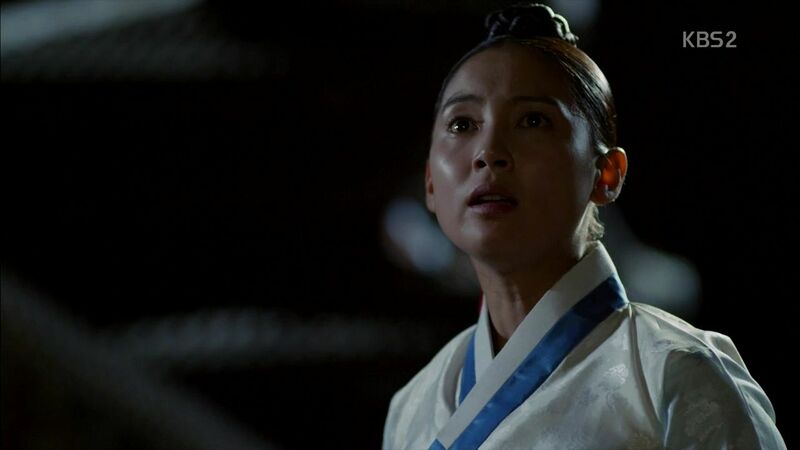 Yoon Kang wants to know the details of the revolution and whether the goal is to overthrow King Gojong. That’s not the intent, they need to keep the royal family safe because the people is not ready for a world without monarchy. They want to get rid of all the corrupt politicians and keep the King around as a figurehead while their enlightenment faction wields the real power. They will free all the slaves and end the court lady system. Yoon Kang hears that they have around 1000 soldiers with 14 scholars returning from Japan, not to mention over 40 of their officials in various positions in court. Yoon Kang is worried about the Qing soldiers stationed in Joseon and hears that Scholar Kim contacted the Japanese to accept their help. 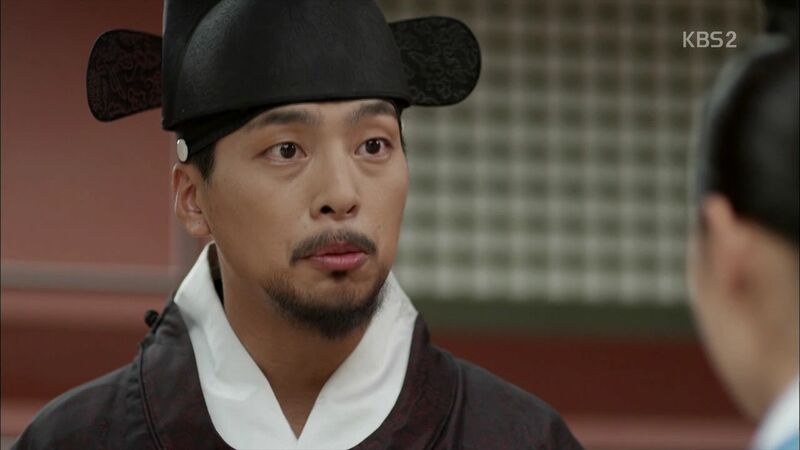 Yoon Kang cautions against accepting help from the outside since ultimately they will want to rule Joseon. They need to do this themselves. Scholar Kim is persuaded to keep convincing the people to support their cause. Scholar Kim shares with Yoon Kang that the Qing dynasty has its own deepening problems so soon they will have no time to interfere with Joseon matters which is the right time for them to act. He assigns Yoon Kang to remain at the base and keep training the soldiers. Yoon Kang sees the little boy is now serving as a page boy here and he’s excited about one day taking up a gun like the full moon gunman to help people. Minister Min has also heard about the looming war in the Qing dynasty and worries that their backer will fall first. Soo In listens to this outside the Queen’s chamber and writes a secret missive to report to Scholar Kim. 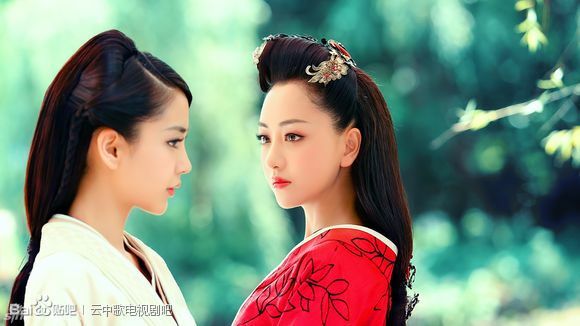 As Soo In rushes through the palace to deliver the secret missive to her contact, she runs into Merchant Choi who is surprised to hear that she’s a court lady now. Soo In is polite but dismissive of him so he uses his ministerial authority to request her assistance on paperwork. Soo In mixes ink for Merchant Choi to write and is careful not to let her secret missive slip out. Merchant Choi notices but moves the conversation to how Soo In left Yoon Kang to become a court lady, effectively ending any future with him. Soo In lies that Yoon Kang is a wanted man so she smartly has moved on. Merchant Choi softly warns Soo In to not do anything rash, he knows whatever she does is still for Park Yoon Kang so he’s going to keep an eye on her. Hye Won is also surprised to hear that Soo In a court lady now and she’s even more certain Soo In would never abandon Yoon Kang so she’s clearly planning something. Merchant Choi’s man reports that Yoon Kang was spotted in the outer provinces near where the Princess’s husband is stationed. Soo In’s letter reaches the revolutionaries as she alerts them to Qing army moving half their forces back. The revolutionaries discuss their best method of attack, a direct invasion of the palace isn’t going to work so Yoon Kang suggests moving the King to a smaller side palace. The Princess’s husband points out the difficulty in getting the King to move palaces, especially after the recent coup. Merchant Choi arrives and Yoon Kang immediately hides behind the partition while Merchant Choi is allowed inside to meet with them. He immediately asks if there is only two men in here and why there are three cups on the table? 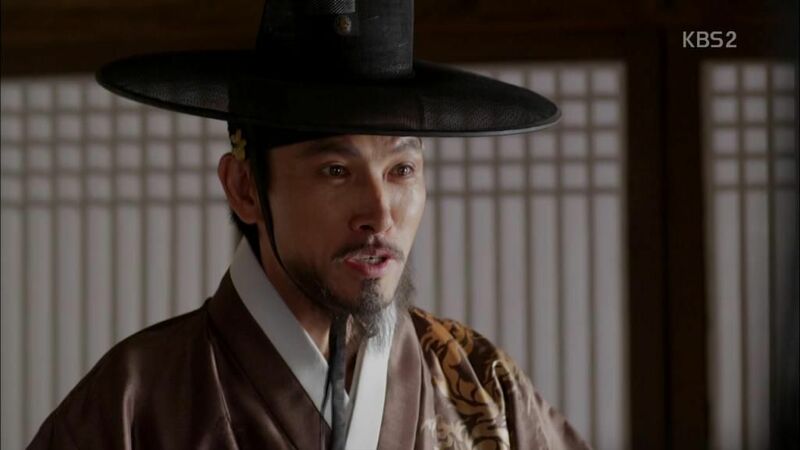 Merchant Choi brings up the rumor that a wanted man was seen near here and wants to search the room but the Princess’s husband uses his authority to keep Merchant Choi at bay for the insulting insinuation that he could be harboring a fugitive. Merchant Choi takes his leave and tells a disappointed Hye Won that he didn’t manage to catch Yoon Kang. Scholar Kim meets with Soo In the palace to thank her for the helpful information. Soo In suggests using explosives to get the King to move to the smaller palace, pretending a coup is taking place so the King willingly moves to a safer location. Soo In offers to make the explosives while Scholar Kim gets Ho Kyung to sneak explosives out of the military base and hand it to their contact in the palace. 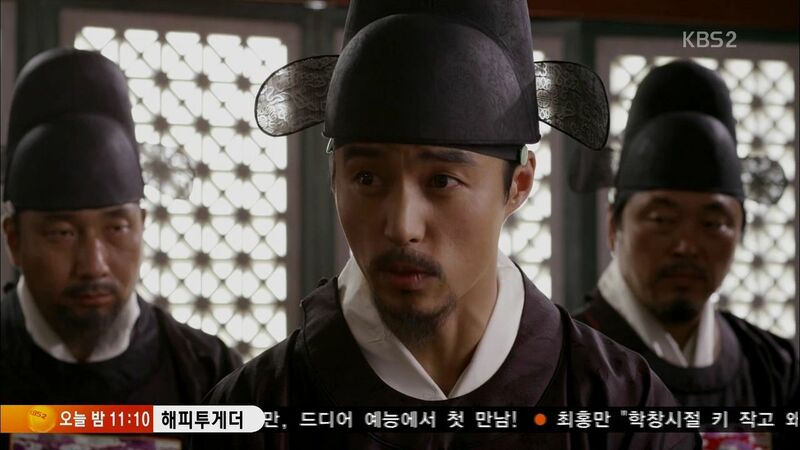 Ho Kyung runs into Hye Won and Merchant Choi in the palace and makes the excuse that he’s seeing his dad. Ho Kyung walks off while Hye Won is headed to see Queen Min. She happens to see Minister Kim walk by and walks over to tell Ho Kyung and instead sees Ho Kyung leaving a package by the side wall while Soo In enters the same area. Ho Kyung runs into Soo In and both give the excuse that they are doing official business. Hye Won goes to see Queen Min and brings up Soo In serving as a court lady and is doing well. Hye Won boldly tells the Queen not to trust Soo In, she’s in the palace for her lover Park Yoon Kang. For Yoon Kang there is nothing Soo In wouldn’t do. When she was arrested over the explosives she would rather be tortured then to reveal Yoon Kang’s involvement. Hye Won suggests Queen Min test Soo In’s loyalty. 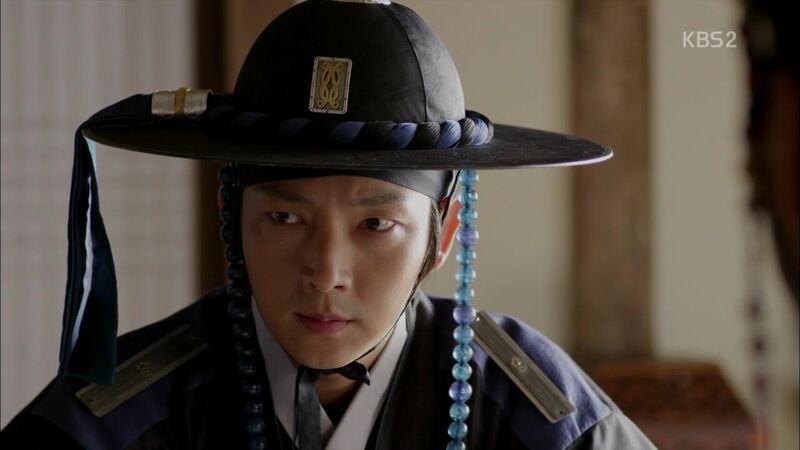 Officer Han parts ways with Officer Moon as he leaves the palace and encounters Yoon Kang. He has Officer Han smuggle him into the palace dressed as a lowly guard. Officer Han asks why Yoon Kang is here? Is it because of Soo In? 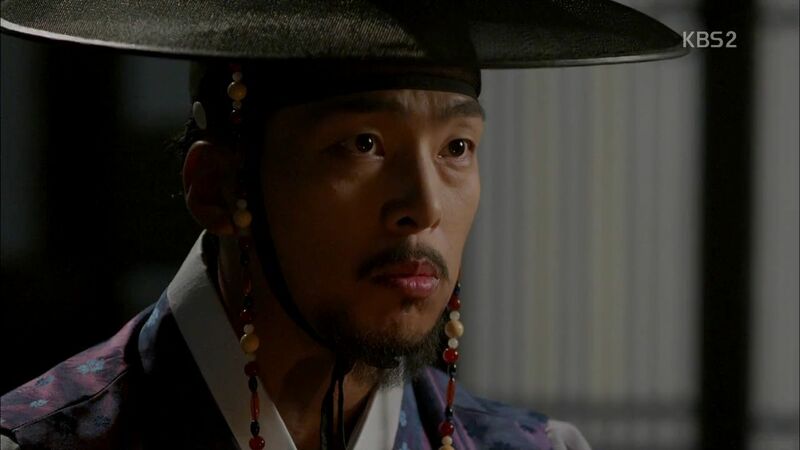 Yoon Kang explains he wants to familiarize himself with the palace layout and Officer Han suggests he not try to run away with Soo In since both of them will become fugitives. King Gojong walks by and greets Officer Han for doing well and Yoon Kang quickly averts his head low to avoid being seen. The King almost walks away before doubling back as he almost recognizes Yoon Kang but the arrival of ministers saves him. 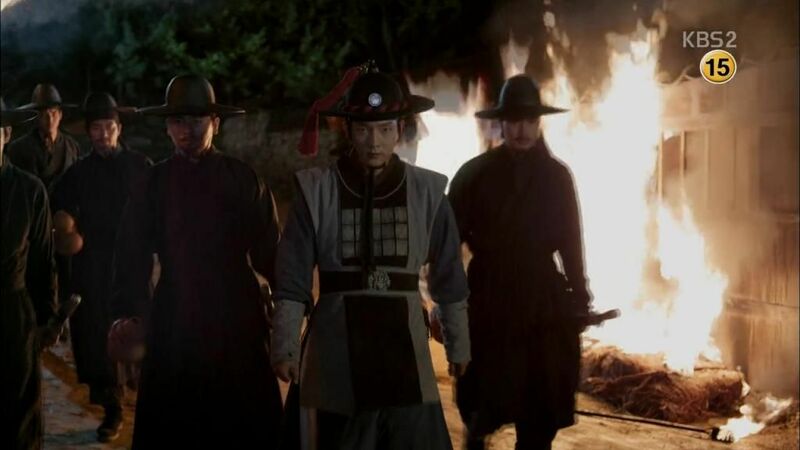 Merchant Choi meets with Minister Min, Queen Min, and Minister Kim to alert them that Yoon Kang appears to be under the protection of the Princess’s husband and Scholar Kim. The soldiers there are also training late into the night. They wonder if the enlightenment faction is planning another political uprising to transform Joseon into ruling model based on the Meiji Restoration. Soo In arrives at the Queen’s chambers and hears the discussion inside about how to remove the Princess’s husband from his post. Instead of demoting him, they will promote him to a higher rank for foreign policy where he doesn’t have any actual power. Soo In hears this and heads off while the Queen’s head lady in waiting follows her to try and catch her betraying the royal family. Soo In is grabbed and pulled into a storage room and finds herself rescued by Yoon Kang. He immediately pulls her in tightly for a fierce hug before checking that she’s doing well, she’s not sick or too tired. Soo In can’t believe he’s here and is even more surprised that he’s part of the revolution with a determination to walk the same path as her. He’s sorry that when she was scared and making the decision alone, he wasn’t there by her side. He will make sure the revolution succeeds and then she can return to his side. Both of them are crying but smiling as Yoon Kang promises to protect her in the future after this is all over. Sang Choo’s clearly a very potent man because his moonlight snuggle with Je Mi has gotten her pregnant. Sang Choo is thrilled and ready to take responsibility by marrying her. Je Mi is more worried that their child will be a slave since she is one. Sang Choo asks her to be optimistic about their future. Yoon Kang hears from Soo In that Queen Min’s side have cottoned onto the budding revolution and tomorrow will promote the Princess’s husband to a new post in foreign affairs so he is away from the post. 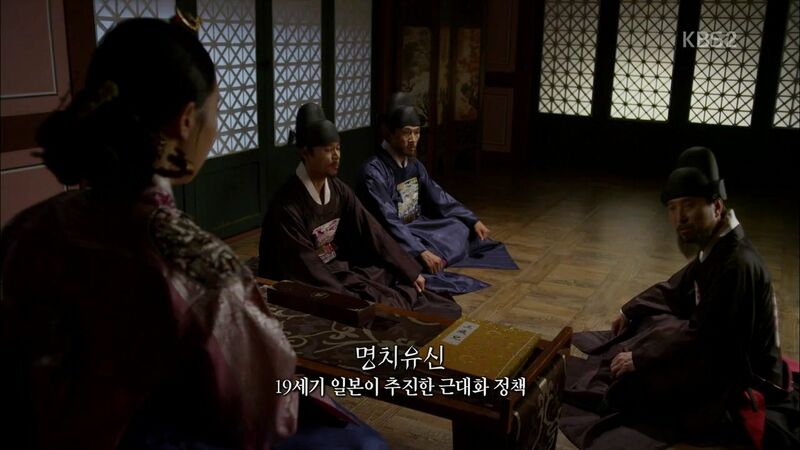 Scholar Kim tries to argue against the sudden personnel movement but the King is certain it can be handled smoothly. 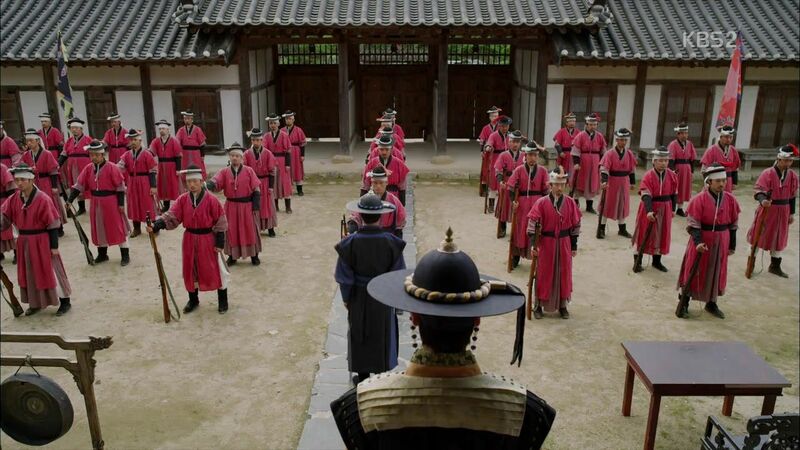 Merchant Choi brings up the well-trained soldiers at the base and suggests moving them to the royal army where they can serve and protect the King. His proposal is also accepted. Minister Kim drinks happily with Minister Min and Merchant Choi, cackling over how they thwarted Scholar Kim and without an army he can’t do anything. Plus the Princess’s husband is being moved back to the palace and its safer to keep one’s enemies close to keep an eye on them. The soldiers are moved to serve under Ho Kyung, which makes Minister Kim feel relieved but we all know Ho Kyung is working for the revolution. Scholar Kim has Soo In rush the explosives plan to move the King, if they wait any longer their plans will be revealed fully. They also need to strike fast and at once to get rid of all the ministers before the reinforcements arrive. Yoon Kang suggests a gathering where all the ministers will be attending so they can taken out at once. In three days there will be a celebration for the formation of a new department and that is when the revolution will take place. Je Mi and Sang Choo are cooing over the little slave boy and want to have a son like him. Yoon Kang pays a visit to Yeon Ha before the revolution and she can sense by his tightly held hand that something may be bothering him. Yoon Kang tries to change the topic but Yeon Ha is certain he’s doing something dangerous. Yoon Kang gives Yeon Ha a reassuring hug and promises to take care of her forever. Sang Choo apologizes for not joining Yoon Kang in the fight but he needs to stay and be a dad to his unborn kid. Yoon Kang understands and wants Sang Choo to take care of Yeon Ha for him. Sang Choo watches sadly as Yoon Kang walks away. 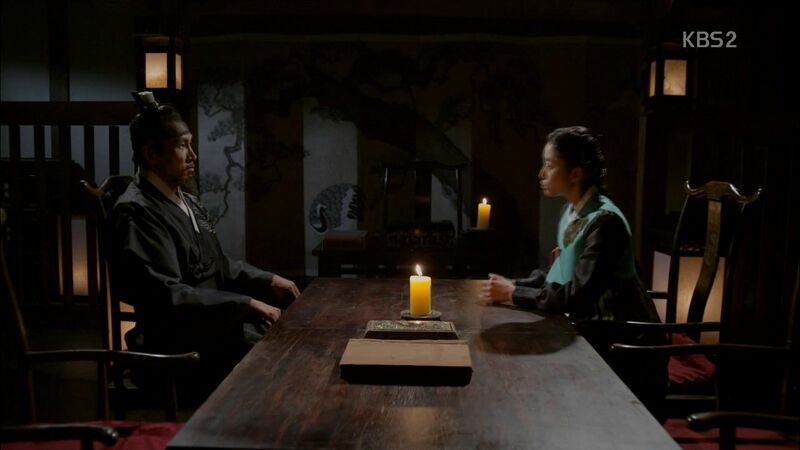 Scholar Kim and the Princess’s husband discuss how they have already gotten the commitment of Japan to provide reinforcements but don’t plan on telling Yoon Kang this right now since he disapproves. Soo In feigns sleeping while another court lady searches her room likely at the order of the Queen to find anything incriminating. She doesn’t find anything but Soo In is alerted to the suspicion cast upon her. She finds that court lady reporting to Hye Won that nothing suspicious was found. We see Soo In has concealed the package in a hidden compartment behind a dresser drawer. Merchant Choi has been invited to the gathering of all the ministers and even foreign ambassadors which makes Hye Won pleased that her dad is becoming more powerful. Merchant Choi vows that he will continue to be more and more powerful and Hye Won is excited to see her dad succeed. Ho Kyung is pacing late at night and his dad wonders if there is anything bothering him. Ho Kyung notices his dad is vccfstill sick and wants him to stay home and rest tomorrow, effectively keeping him safe. But his dad insists on attending the important gathering tomorrow. The celebration gathering is being set up while the revolutionaries are making final preparations for their attack tonight. Soo In has the explosives ready and takes the package to the palace. 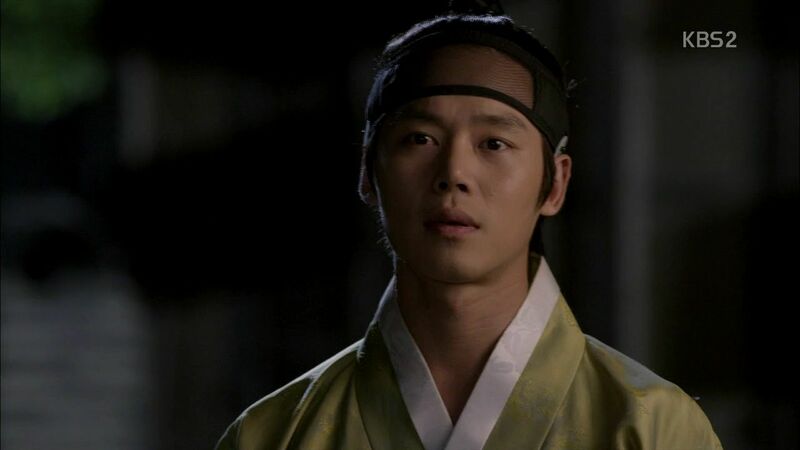 Ho Kyung gets note that the revolution is tonight and asks him to bring the soldiers to the palace. 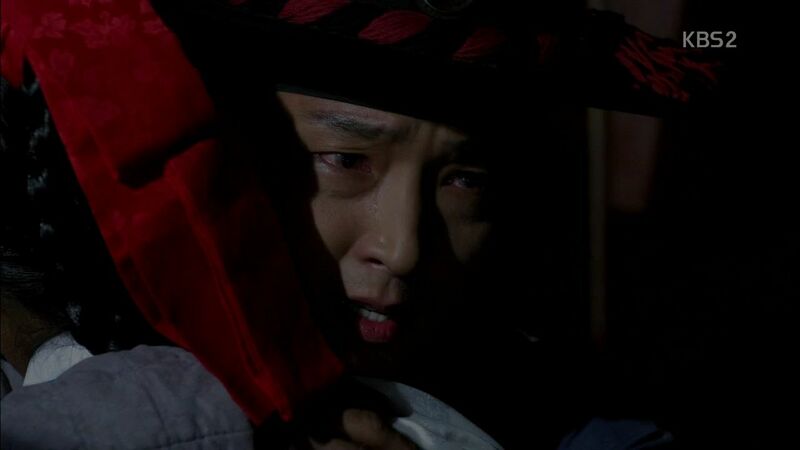 Ho Kyung has his subordinate do it as he rushes off to save his dad. The celebration gathering begins and everyone happily greets the guests. Yoon Kang arrives with his small band of troops and sets fire outside the gathering. Ho Kyung arrives at the gathering which upsets Scholar Kim to see him there. A guard runs inside to announce that a fire has started outside and all the guests to to hurry off to safety. Scholar Kim and the Princess’s husband leave together while the gathering descends into chaos as the guests escape to safety. Joon Gi is my nu 1 bias, and I love him, almost everything . Since he’s not awesome on those martial arts skills, but he also can emotes well with all those beautiful expresives eyes. 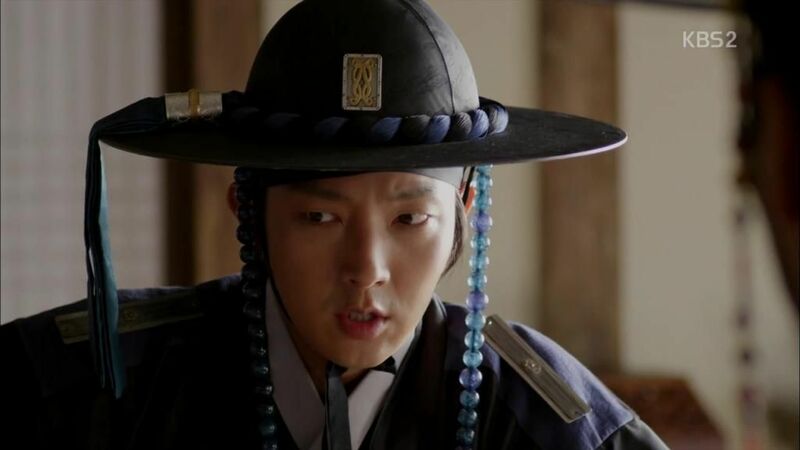 Joseon Gunman is a dream project that Pd’nim want to creates another awesome Sageuk. What I do miss in this JG are the thrill…..yes, the thrill factors that makes me fidgeting around when I see a drama. 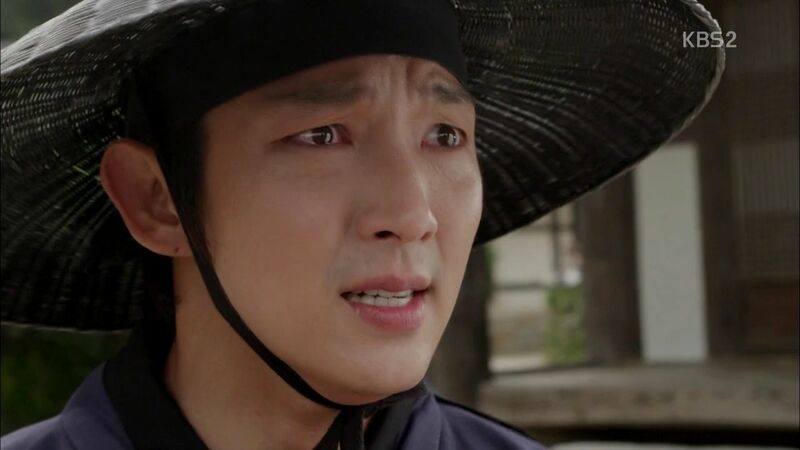 Well, I kinda have this feeling when I watch Joon Gi’drama, especially in TBDAW. I lost this thrill feeling….I just well…lost it along the way. 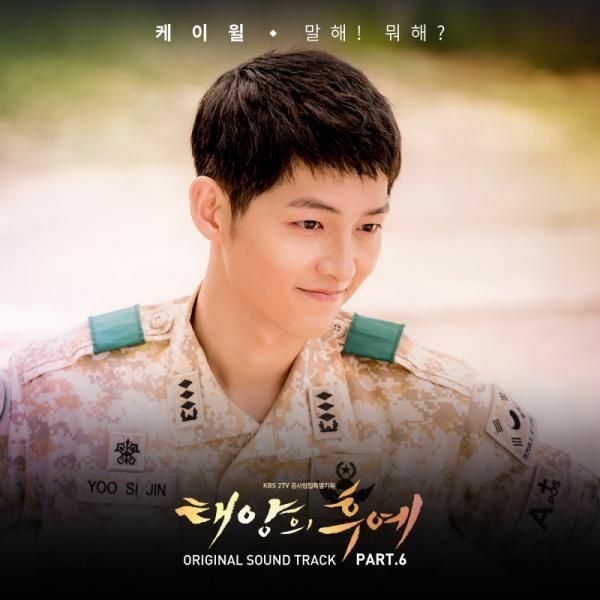 Joseon Gunman also not have an engaging OST and BGM. The awesome OST are releasing on the later, but not in the beginning. PD, Actors and production are great, but not the writers. 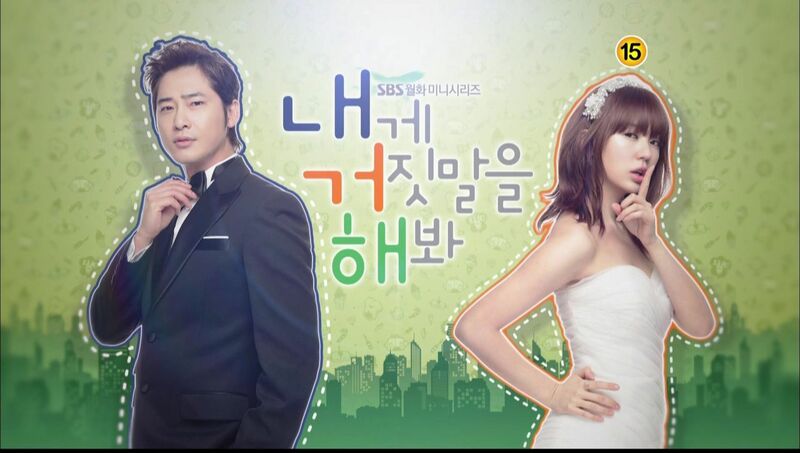 The writers are new, they are great to makes a short drama or drama special, actually I love KBS Drama Special, but I have to admit that this writer not in a level yet to be par with those tight storyline when they have to writes a long episodes drama that not feeling a ‘dejavu’….I mean ‘dejavu’ in a drama are okay, but a ‘dejavu feel’ in 1 drama are more than enough. Well, this Joseun Gunman are simply missing something, the spiciness are not hot enough. 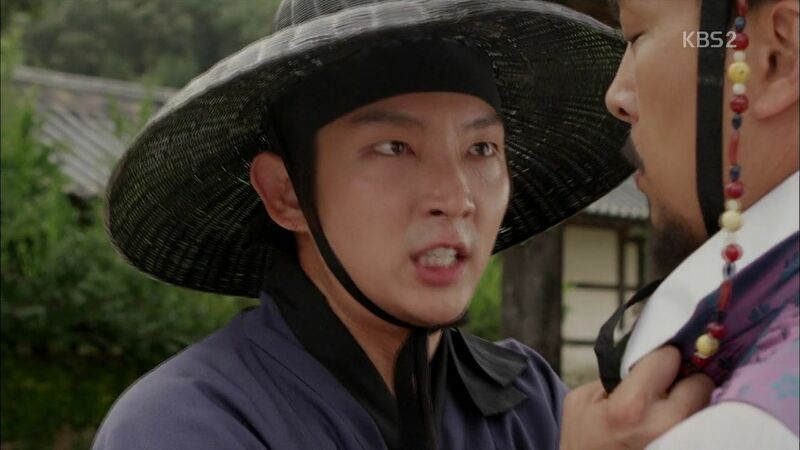 so, since I love all Joon Gi action in this drama, I makes some film base on his action scenes and deleted some scenes ( well..many scenes…uhm…don’t want to tell which ). 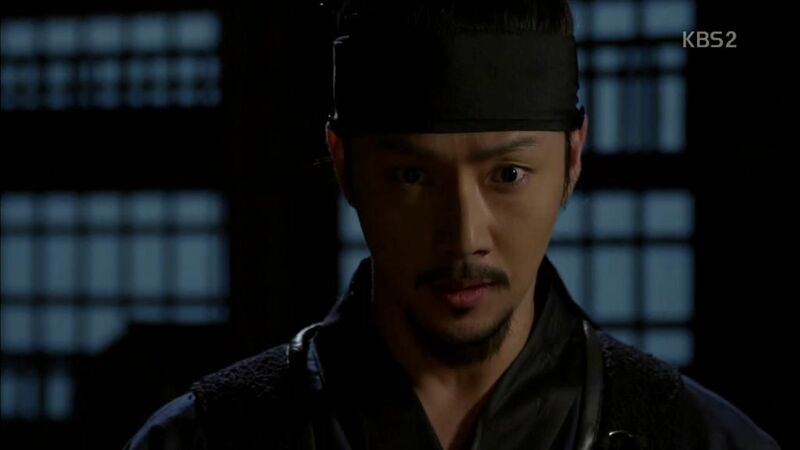 And..Voilla’ I have a very awesome Action Sageuk Film….hahaha. The opening off course begin with Hanjo time in Japan. My issue is that I need some romantic passion somewhere if there is an OTP present. It doesn’t have to be long and drawn out or even the main focus of the drama, but it does have to be passionate and have a payoff for me. One of you mentioned spiceness… And I think that’s the perfect word to describe what is missing from the OTP arc of the story. I complained about this in FTLY where for 4 and almost 5 episodes, I felt like it was slow and going in circles. I feel the same way about JG. Where is my payoff for sticking with our OTP? I love JK and NSM to bits. I think they are so great together. But I do think the storyline is suffering quite a bit for the extension and also I think even before that, it was spreading itself a little thin. Hmm… I make it sound like I need a romantic part in a drama to like it but I don’t and didn’t mean it that way. I just felt like this drama had a OTP arc to the story and thus, they should give it us with equal passion as the revenge and revolutionist part. There just feels like a little something missing there.